My previous article Customized ListView with Image and Text gives you a good overview of customizing a list view which contains a thumbnail image and few text fields. All the list data will be downloaded by making a network calls. The main challenge in that tutorial is downloading the images asynchronously and caching them. Because of lack of good tools I used a third party library (it is a good library though) to download the listview data and caching the images. Today I am going to explain the same, but this time with a different approach by using an another library called volley. By using volley you can see decent improvement in listview performance without much effort. 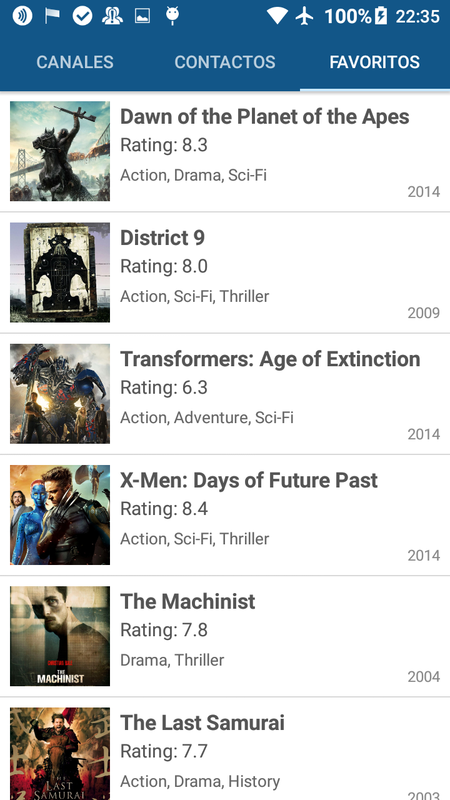 The list view we are going to build contains list of movies information where each list row defines single movie. 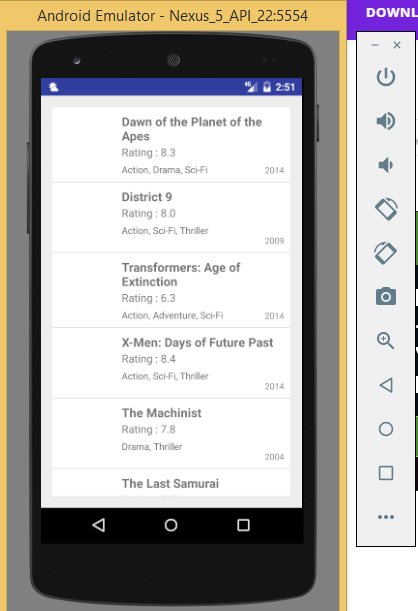 The row layout is customized that contains movie poster as thumbnail image on the left and the movie title, rating, genre and release date on the right. Below is the final output. I am going to use this example json to load the list data. This json contains array of objects where the each object contains information like movie name, rating, genre and release date. Now let’s start by creating a new project. 2. Once the project is created paste the volley.jar in libs folder. 3. I am creating required packages first just to keep the project organised. This step is optional but it is recommended. Create four packages named adapter, app, model and util. So after creating packages my project contains following. 4. Open colors.xml under res ⇒ values and add below colors. If you don’t see colors.xml file, create a new file and add these color values. 5. Also add below dimensions in dimens.xml file located under res ⇒ values. 6. Before start writing java code, I would like to complete the UI part first. Create list_row_bg.xml, list_row_bg_hover.xml and list_row_selector.xml with below respective codes under res ⇒ drawable folder. If you don’t see drawable folder under res, create a new folder and name it as drawable. list_row_bg.xml – Default style for list view row. list_row_selector.xml – Selector file to toggle the row states. 7. Now open your layout file of main activity(in my case activity_main.xml) and add a ListView element. Here we completed the design part. Let’s move to java part. 9. Create LruBitmapCache.java under util package. This class takes care of caching images on disk. 10. 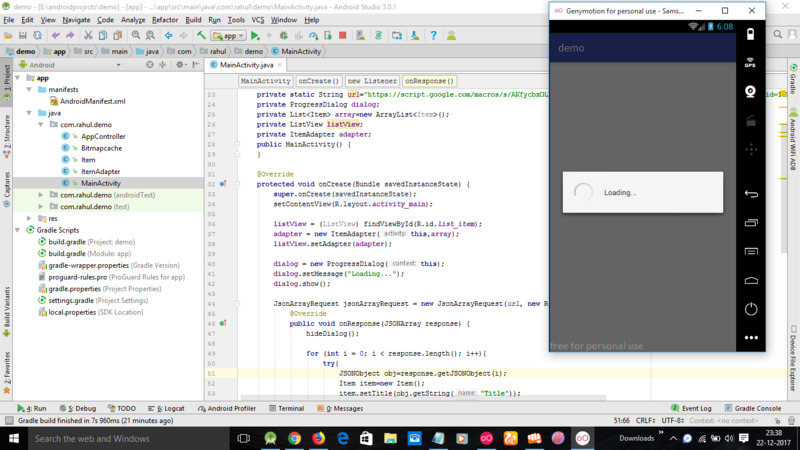 Create AppController.java under app package. This class is a singleton class which initializes core objects of volley library. 11. Now add the AppController.java class in AndroidManifest.xml to your <application> tag using name property to execute this class on application start. Also add INTERNET permission as we are going to make network calls. 12. Now create Movie.java under model package. This model class will be used to provide movie objects data to list view after parsing the json. 13. Create a class named CustomListAdapter.java with below code. This is a custom list adapter class which provides data to list view. In other words it renders the layout_row.xml in list by pre-filling appropriate information. 14. Now open your main activity class (MainActivity.java) and do the below changes. Here I created volley’s JsonArrayRequest to get the json from url. Upon parsing the json, I stored all the json data into an ArrayList as Movie objects. 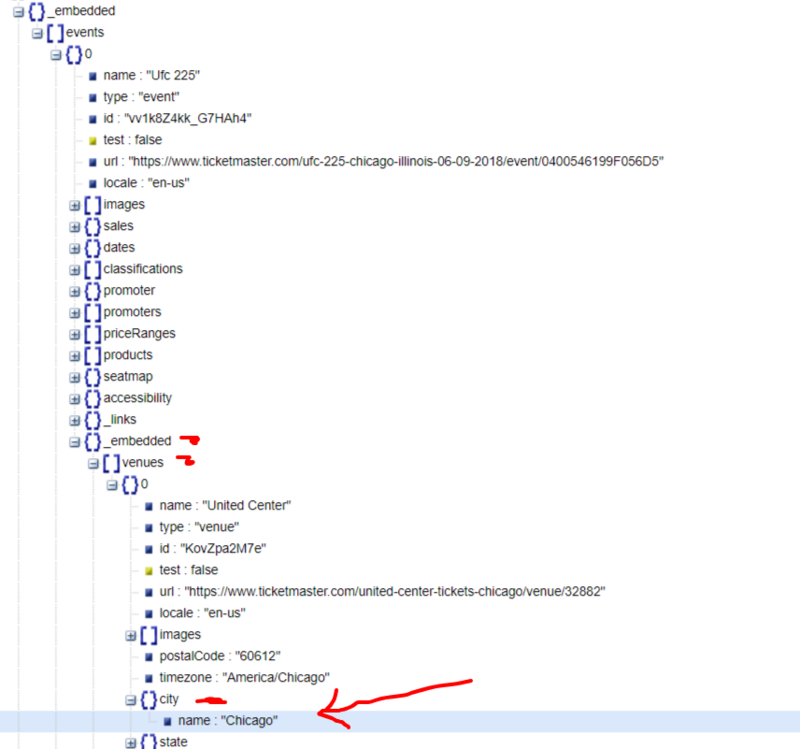 Finally I called notifyDataSetChanged() on CustomListAdapter instance to render the list view with updated information. Now run the project and test it once. Please do comment below if you ran into any issue. It worked! I’m trying to solve a little problem with the image only! Paste your json parsing code. Great. Have you found out the problem? It seems you are not checking for null response from http call, but accessing the response. Why are not using Image Caching libraries like Glide, Picasso or Fresco? good Aternoon ! Sir today ii tested the app with glide library but the memory allocation is almost the same. In the library you can mention the max cache size somewhere. Awesome Ravi! This isn’t the first guide from you that helps me, there have been other using Material Design but this one I just loved It! I have just finished your guide and it’s working really great!, some minor problems with the new HTTPS from your blog but nothing that a little gist can’t handle haha. Thanks a lot!! Your blog is one of the best ones! Yeah updating all the articles to https is a big task for me. I modify them one day. I downloaded code and run ‘app’ to install it. I run app but it shows empty slots. There aren’t films and other things. I run it on android studio. Could you try the changing the url to https in the code? Yes, it worked but it doesnt show images. I guess it is because of image url. If I change url to image: “https…”, it will work. I have a question, how can I change url in this code. I want to add “s” after “http”. I have to modify the image url in the json and update on the server. A quick fix can be replace the http to https in image url before passing it to Glide library. The application is not opened.? In the code could you try to change the json url to https? Hello Ravi Sir can you please suggest a tutorial that show how we can implement detailView in the above tutorial when listitem is clicked??? Please Sir this is urgent i couldnt find good tutorial. if possible mail me in. In the first step you said to create 4 packages. I did create a package but it didn’t show up in my project structure. What I did is I right-clicked on the app directory, and click new Package. When I tried to create new Package under the same name, it says “adapter with the same name already exist”. Where does the package exist or what did I do wrong. You need to toggle the project view from Android to Project. Also it hides the empty packages. Please explore in this area. I am beginner in Android development .Your tutorial is very useful for reference. Can you give me source code php and database? It’s just static json created. Not fetched from db. and why image not appaear in my emulator, sir? Yup, recently the site is moved to https. You have to replace http with https in image urls in json. Hi Ravi, How can I have the list view to auto refresh and get the data again every 10 seconds? Thank you so much. Do you have any source? This works, but every time it refreshes the list blinks. I can’t figure out how to prevent this. Anyone have any ideas? I have replaced the image url then also the images are not displaying. Have you replaced http with https? i pasted the code in android studio but it is showing several errors i rectified some errors.still there are errors.can you please help me to rectify those errors.R.”menu”.this is in red color last line in main activity java class. how to make it can acces data from database? what about if its from json Object? help me please. what IDE you work on , this doesn’t open with android studio !! It’s older Eclipse project. 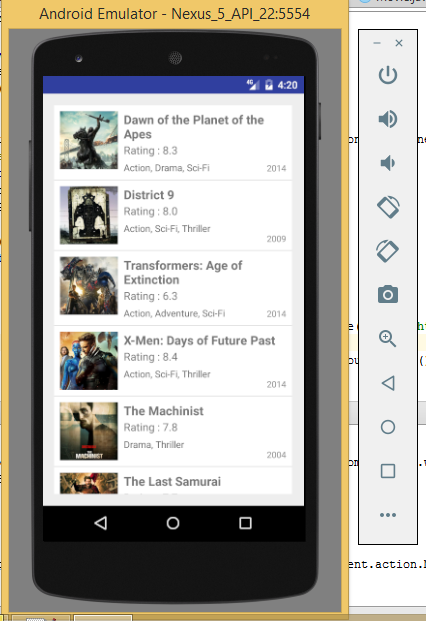 Try adding one by one file (by reading the article) in android studio. While i run the code , this problem was appear !! Seems the value in a variable is null at line #50 in MainActivity. Could you post the code of MainActivity? I follow your tutorial. But now I need to add search functionality. Can some please help me with this please. Phuzz!! 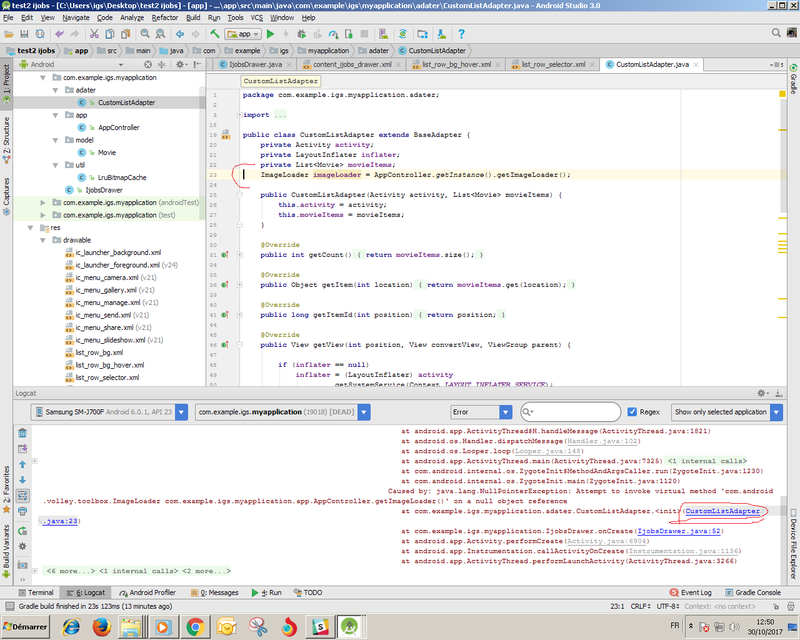 In custom list adapter.. i have the following error in Android Studio. What am i missing or what did i not do right. AppController is not assigned to an Activity?? I get a DeadObjectException whenever I run the app. It worked in the beginning but now nothing works. Please can you clarify why menu can not be resolved ? You need to have a file in res -> menu -> main.xml or remove the onCreateOptionsMenu completely. May be you are making Json Array? You can find the JsonObjectRequest code sample here. Hello Ravi, I have been referring your posts since long and they are truely usefull, whenever I have any new functionality I first of all refer your post..I referred this code but I am facing issues when I replace your Json url with my php web service ..so can you please help me in fetching images into listview from my database through web service. Post your json response along with parsing code. I can verify once. Hello Ravi, Im getting this message how can I fix it please? Post your layout file of list row. I’ve been searching everywhere but can’t find a solution it would be greatly appreciated if you could help me with this! Check the LogCat to see the errors. If you understood this tutorial, I suggest you to learn RecyclerView as ListView is deprecated. Hello Ravi Tamada! First, thanks alot for your great and easy understandable tutorials! Secondly i got some questions regarding the listview example here. I converted the project to use it with a sidebar and fragments, right now i want to click an item from the listview and open another fragment with detailed information. First question, can you recommend me a good method to parse the data from the arraylist to the second fragment? The Second question i have is the following: When i go back from the detail fragment to the listview fragment, it will refresh automatically, adding the same items it already fetched before a second time. So first thing i tried is to clear the list on every oncreate, but i think it would be more practicable to leave the already fetched information on back button pressed, but i dont know how to implement this. Do you have an idea? 1. First question, can you recommend me a good method to parse the data from the arraylist to the second fragment? If you using POJO objects, extend the POJO class from Parcelable and pass the selected object to second activity via Intents. 2. The Second question i have is the following: When i go back from the detail fragment to the listview fragment, it will refresh automatically, adding the same items it already fetched before a second time. This can be solved by storing data in local database and load it from there. Also you can use savedInstanceState method to check whether activity is newly created or resumed. thanks for your valuable tutorials..
Why we have to use https in this case? Because http on my blog redirects to https throwing 301 code and JSON won’t be received. Brs and thanks in advance. Download the code, generate the apk and install it into your phone. Make sure the new data appears in your JSON first. Can I use Picasso instead? You need to enable MultiDex support in your project. Search accordingly. I also disable Instant Run. Then i again run app but same error occurs. Images are on my server and the path is created using the folder name on the server. Have you ever run a server like Apache or Nginx in your local machine? Thanx a lot for this amazing tutorial, this saved my day while giving a interview test. 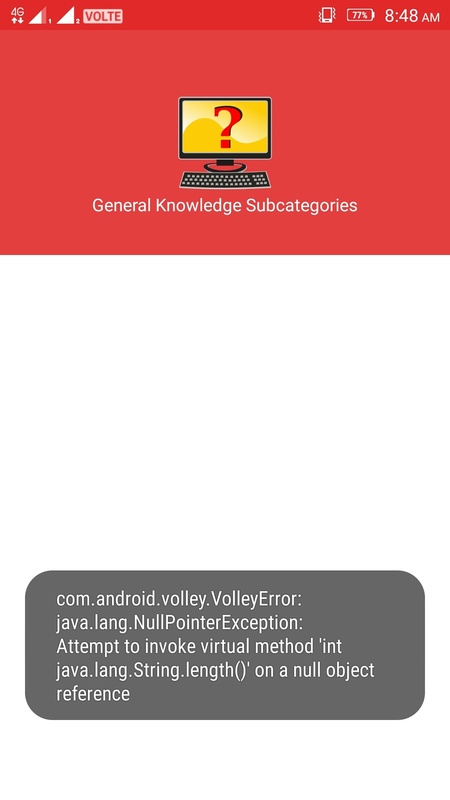 Im new to android ,how to parse the same api using volley with recycleview and glide. This article resembles the same (Glide, RecyclerView and Volley). You can read and modify the code accordingly. How can i do it? I have no idea about it…. Have you ever used Gson? Read these article that uses Volley and Gson to parse the JSON. Once you are comfortable using Gson, the below thread can help you parsing your json. Hello Sir, this tutorial is really helpful. I have a question, what if a certain image url has no file existed, what can we do to catch this error?